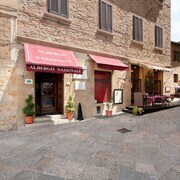 The location of the hotel couldn’t be better, Located in the middle of a medieval town in Tuscany. Beautiful hotel and room was spacious, staff was so kind and generous very wonderful! 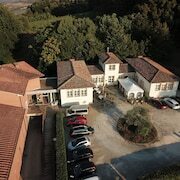 Where to find Volterra hotels near an airport? Where can I find hotels in Volterra that are near tourist attractions? Hotel choices are aplenty in Volterra. There are 27 accommodation options within a 0.1-kilometre (0.06-mile) radius of Volterra's downtown on our informative and up-to-date accommodation database. Why not book a convenient spot close to the beating heart of Volterra? The Park Hotel le Fonti and Villa Porta all'Arco are located 1 kilometre (0.6 miles) of the town center. Also, there are a number of accommodation near the Roman Theatre and the Piazza dei Priori. 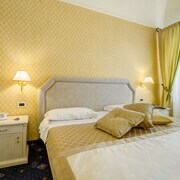 The Albergo Etruria and the Hotel La Locanda are close to the Roman Theatre and the Hotel San Lino and Albergo Villa Nencini are close to the Piazza dei Priori. If you're traveling on a budget, you will be happy to discover that there's a reasonable selection of lower-priced hotels and apartments in Volterra. The Albergo Nazionale is 0.09 kilometres (0.05 miles) from downtown, while the Hotel Ristorante Molino d’Era is 6 kilometres (4 miles) away. 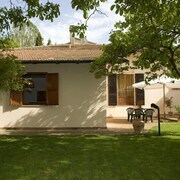 The Casa al Bosco and the Camere Renzi are two of the other recommended affordable accommodations that you could investigate. 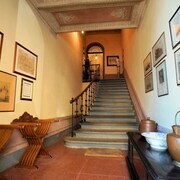 The Relais Borgo Santo Pietro can be found 35 kilometres (22 miles) away from the main part of Volterra. Another hotel is the Castello Di Casole, which can be found 20 kilometres (13 miles) away. Two other options in this area include the Castello di Tavolese and the La Collegiata. Looking for things to do? Consider spending a few hours exploring Casciana Thermal Baths and Castello dei Vicari, which you'll find in Casciana Terme, 25 kilometres (17 miles) to the northwest of Volterra. Expedia-listed Casciana Terme hotel options include the Hotel Villa Margherita and Villa Borri. 50 kilometres (32 miles) to the northwest of Volterra, is Tirrenia, home to the Grand Hotel Continental and Green Park Resort. The Bagno Vittorio Emanuele and Il Paguro are just a couple of the more popular attractions to see while in Tirrenia. Why not spend a few hours hanging out with Pisa sports enthusiasts at a local sporting fixture. You'll find Stadio Artemio Franchi 55 kilometres (34 miles) to the northeast of Volterra. Sleep close to the action at the Four Seasons Hotel Firenze or the The St. Regis Florence. Galileo Galilei Airport is a practical airport, and is 50 kilometres (31 miles) from Volterra. Accommodation options nearby are Relais I Miracoli and Hotel Relais Dell Orologio. What are the most popular Volterra hotels? Are there hotels in other cities near Volterra? 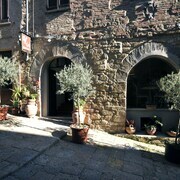 What other types of accommodations are available in Volterra? Explore Volterra with Expedia.ca’s Travel Guides to find the best flights, cars, holiday packages and more!